We met more of the America batch last night & today. It was nice to meet them on facebook months back, but they are even nicer in the flesh. It’s handy to know about all the things to be prepared for. They’ve travelled around so much after a month already it is quite impressive. Today I played some table tennis, little bit of basketball, got a hair cut (which included a head, ears, neck, shoulder, arms, fingers, upper and lower back massages while sitting down all for 70p! ); we had a nice pasta dinner with HR and also watched two movies at the multiplex theatre. The multiplex is impressive: big screen, has decent surround sounds, comfortable seats and the picture quality is amazing. I’m not sure if they project the movie by using a DVD player or actual film, but they showed a MS Windows desktop during an intermission. Transformers was a really good film, enjoyed it lots. Excellent computer graphics and funny comedy moments intertwined in tense action/romantic scenes that did actually work. The ticket was 31 pence! Later, due to the power of Ecta’s & Kusum’s persuasion, Jason & I watched a Bollywood movie called ‘Chak De India’. There was an amazingly long queue for it yesterday and it is the top film in India right now. It’s about a former disgraced hockey player (for hand shaking a winning Pakistani team player once) coaching up the Indian women’s team. I left after 20 minutes but would have watched more if only there were subtitles. 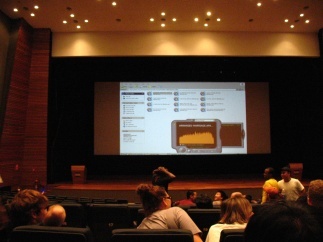 Photo: Inside one of the theatres at the multiplex during a break. This entry was posted on Sunday, September 2nd, 2007 at 7:11 pm	and is filed under Mysore Campus. You can follow any responses to this entry through the RSS 2.0 feed. Both comments and pings are currently closed.